Saree fashion is constantly evolving and coming up with some of the most alluring styles and drapes of all time. From Pant-style sarees to Lehenga sarees, all these ideal picks look their best when pairing up with the right kind of designer blouse. No saree look is well-styled without a well-fitted saree blouse! Be it some TV serial celeb or B-town Fashionista, we all look up to our favourite stars when it comes to style goals. These celebs have left no stone unturned in making these Indian saree blouses a big hit. The previous year witnessed a lot of bold blouse patterns and as well as royal ones. From Deepika Padukone to Anita hassanandani, these celebrities come up with some of the most standout blouse patterns which each one of us must try. 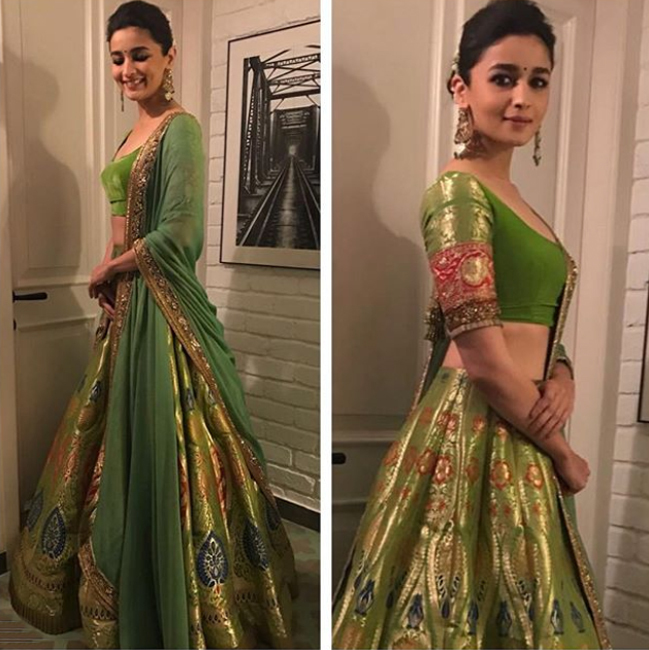 Here is a rundown of all the lovely patterns of Bollywood designer saree blouses that amazed us in 2017 and now we are looking forward to bring some style in our saree look, in 2018 as well. From Deepika to Jacqueline, the cape style has become the favourite one in each woman’s list. The cape style blouse pattern is a unique creation to add some extra embellishment in the saree look. They look very classy and modern while giving the modern feel to your conventional saree. In case you have to match a particular blouse with your lehenga choli, go for traditional ways. A royal looking blouse with simple deep neck and long embroidered sleeves till your elbow is the best way to compliment your lehenga or lehenga style sarees. Half & Half sarees have considered as the ideal pick for party wear sarees. Choose a gold sequin and embellishes blouse pattern for best party vibes. You can customize it with a high stone studded or embellished neck so that you can wear it without a heavy necklace set. Nobody can pull up the ravishing one-shoulder designer blouse more gracefully and confidently than, Miss B-town Fashionista Sonam Kapoor. Making the style hit, these Bollywood designer saree blouses are a perfect blend of Indian and western style. While working for Tjori from very lengthy time-frame, I have built up an unmistakable fascination for Indian ethnic form.